In Xavier Beauvois’ film Of Gods and Men, eight French monks must decide whether to leave the war zone they live in and return to the safety of France, or to stay with the people in their village who cannot leave. Will they return to France to save their own lives and leave the people behind? Or will they stay and continue to aid them? Their village is an Islamic terrorist war-zone in Algeria, and the government there is not helping much. The monks provide medical and physical care for the people living in the village, many of whom are refugees. The monks are Christians, though the people in their village are an eclectic mix of religions, many of which are Muslim. Part of the monastery is a hospital and brother Luc (Michael Lonsdale) is a doctor, probably the only doctor in the area. Their leader, Christian (Lambert Wilson) is of the opinion that they should stay and many of the other monks are unsure. The monks believe that there are more ways to beat the terrorists than by killing them. They continue to minister to the people despite opposition and danger. The screenplay is simple and the only music you hear is that of the monks chanting. All of the Algerian scenery portrayed is beautiful and calm. True to the time and events, the costumes are simplistic. 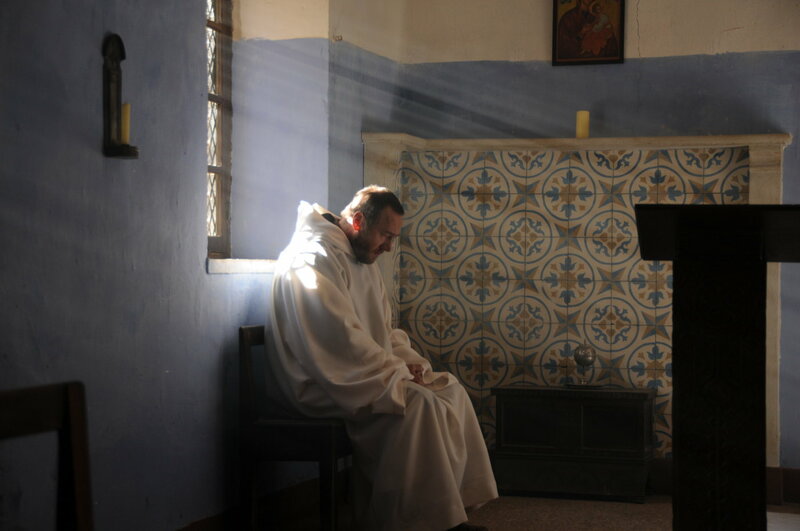 The uncomplicated nature of the film places the viewer in the monks’ place to see the situations through their eyes. The movie’s minimalist approach achieves the aspect of truth in the movie. The film, which is beautiful in many ways, is sometimes hard to follow and difficult to grasp. (I am sure it would be easier if I was a native French speaker.) The portrayal of the government in particular is confusing because the monks are in opposition to it in certain ways but in other ways they seem to be in agreement. The movie emphasizes the impact for good that empathy can have and the impact for evil that violence has. The ways in which the monks empathize with the people are unusual; they ask for no payment or recognition, and they work for Christ and not for other men. They also empathize with the terrorists and are sorrowful when their leader is cruelly killed by the government. There is more than one way. Violence is not the only or the best way to combat evil. If I was in the situation that the monks were placed in, I would be sorely tempted to return to the safety and comfort of home. Many people would probably tell me that that was a good decision and to care for myself above all else. The film was inspiring to me because the monks were selfless and humble. They cared so deeply for the people, more deeply than they cared for their own safety and comfort. This film is a meaningful, inspiring picture of Christ-like love for others. The monks lay down their lives for the people. I would recommend this movie to people, but tell them to come to the film with an open mind and to wisely consider the monks’ actions. Martha-Grace Jackson is an eighth grader from Charlotte North Carolina. She is child 2 of 7, a serious violinist and pianist, teaches some young students, and enjoys studying Greek and Latin. She also enjoys crafting, listening to podcasts, and reading fantasy fiction. Wow, I wish my first movie reviews had been this good, especially for a film this challenging and haunting. Best of luck to Martha-Grace. P.S. “the only music you hear is that of the monks chanting.” You forgot the scene where the monks sit around the table listening to Swan Lake before the final attack on the monastery, which is one of my favorite scenes in the film. Q&O: What should I see this week?